Summertime is amazing, but hair turning into something that closely resembles hay is a real possibility. Between the sun, air conditioning and things like swimming our locks tend to take a huge hit at this time of year and so it's important to have effective products on hand. I often use inexpensive deep conditioning masks which work ok to keep a certain level of hydration in my hair, but summer is the time to pull out the big guns. Products that you know will give your hair a huge boost of moisture, leaving it feeling silky soft and help to protect or reverse the drying effects. Having hair that is bleached as well as dyed blonde and already fine and fragile- I find having good haircare is essential. I've been trialling two products from Kerastase who are a high end haircare and salon brand, here's what I thought! This is by far the thickest and richest shampoo I've ever used, the consistency is a lot like a very thick conditioner. At first it seems like you'll need a lot of it to cover the hair because it doesn't feel as though it will go very far, but as soon as you start washing your hair the magic starts to happen and it creates an amazing lather which feels really luxurious. This is a far cry from regular old highstreet shampoo, everything about it feels gorgeously high end from the texture to the salon style scent. As you can imagine, such a rich shampoo does wonders for the hair and leaves it clean, smooth and sleek; it's designed for very damaged and over processed hair so is perfect for this time of year. This would be ideal to use either on holiday or after you've come home to repair some of the damage, or after bleaching or colouring your hair. The mask is on another level to anything I've used in a long time, as with the shampoo its thick and rich and is the type of product you know is going to make a huge difference even as you're applying it. 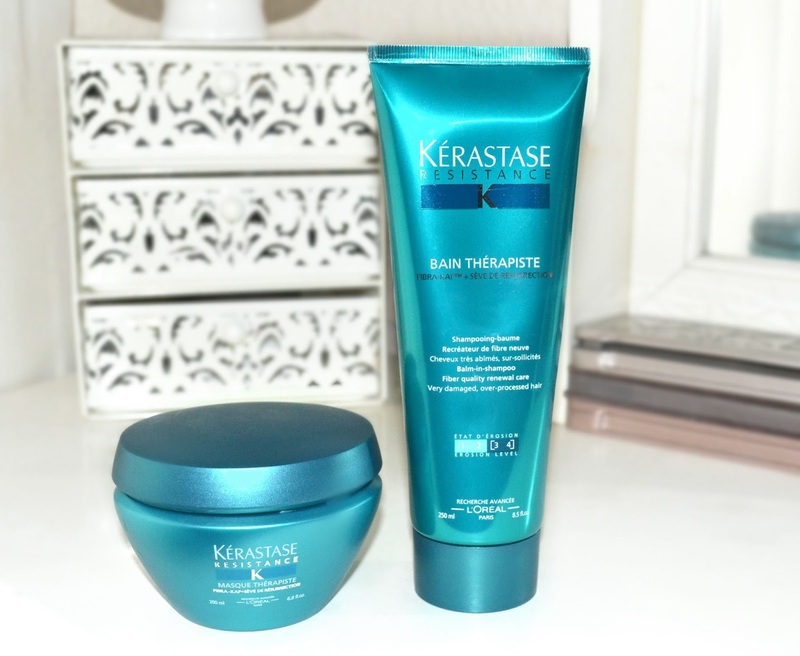 It's ideal to be used along with the shampoo if your hair is in a bit of a bad way, as it's a repairing mask designed for very damaged and over processed hair. The packaging states that this is for thick hair, mine most definitely isn't thick but it still works perfectly leaving it highly moisturised without leaving it looking limp or weighed down. Simply leave it on for ten minutes to allow all of the amazing ingredients to work their magic: gluco peptide to enhance the resilliance of the hair fibres, amino acids which attach themselves to hair to compensate for loss of mass and 'ressurection sap' to preserve the structure of the hair fibre. Never tried either of these - they sound great!